The Hydro-Aid Moisturizing Soothing Cream is formulated with birch sap extract and moisturizes, soothes, and relaxes tired skin. It comes packaged in a glass jar and contains 50 ML of product. It sells for $90 via Sulwhasoo, but you can get it for less at duty free or if you happen to be in Korea. 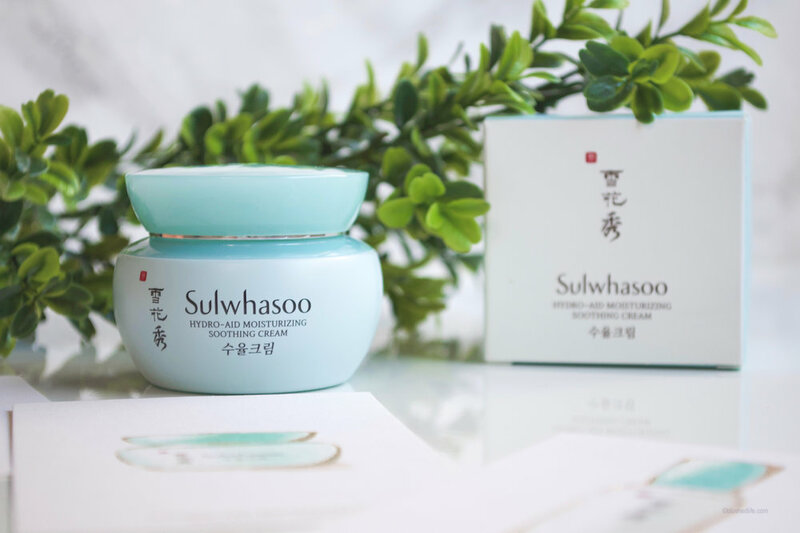 It could all be psychological, but I love how Sulwhasoo incorporates a lot of herbal ingredients into their products. This gorgeous moisturizer is packed with birch sap (Betula Platyphylla Japonica Juice), which purifies, moisturizes, and soothes skin. It also contains Liriope Platyphylla and Ginseng Sprouts, which offer long-lasting hydration. Lauric Acid can potentially be comedogenic, but I didn’t experience any breakouts. Aside from that there are no significantly harmful ingredients. I think what stands out the most for me is how soothing this cream feels. It has the most luxurious watery/cream/gel texture. Too creamy to be a gel, but too thin to be a cream, it’s the perfect balance to give max hydration without being overwhelming. It does remind me of Nature Republic’s Super Aqua Watery Creams, but 1000x better. I didn’t need to refrigerate this cream (its suggested to refrigerate it if you want the ultimate cooling effect) and my usually “hot” dehydrated skin was literally bathing in a cool lap of moisture. Ahhhh! Kevin has extremely dry skin and he also fell in love with this cream immediately. (He literally just said, “My face feels supple.”) We both appreciate how this cream absorbs well into the skin without feeling greasy or sticky. Usually with creams like these, the moisture disappears after a few hours leaving you dry all over again, but this one sticks around and you feel hydrated all day. As with other Sulwhasoo products, this one does have a light fragrance. It smells light, clean, and with some hints of citrus that helps refresh and relax. It’s not as intense as the fragrance in their First Care Activating Serum. I actually love the smell of it since it’s so light, non-irritating, and dissipates quite quickly. Yes, this cream is expensive, but it is so worth it. If you can splurge, then you’ve got to give it a try! I’m about 99% positive this cream is making it to my permanent shelf. Husband tested, husband approved.